The French were the first to settle in Alabama, establishing Mobile in 1702. From 1702 to 1763, southern Alabama was French. 1763 to 1780, it was part of British West Florida, and 1780 to 1814 part of Spanish West Florida. Statehood for Alabama was delayed because there was no coastline. Andrew Jackson's capture of Spanish Mobile in 1814 rectified the lack of coastline, and Alabama became the twenty-second state admitted to the Union, in 1819. On August 18, 1910 at 3:30 p.m., the gates of Rickwood Field opened to the public for the first time. As more than 10,000 cheering fans watched, the Birmingham Coal Barons triumphed over the Montgomery Climbers 3 to 2. The park was built by Birmingham industrialist Rick Woodward, who founded the Woodward Iron Company. Rickwood Field was modeled after Pittsburgh's Forbes Field and Philadelphia's Shibe Park, and like Shibe Park there are no stands in the right field. Rickwood Field is America's oldest surviving professional baseball stadium, and continues to host baseball games and other events. From summer of 1948 to April 2011, Gus Koutroulakis went to work every single day except for Christmas Day and Thanksgiving Day. When he took a three week vacation in 1995 it made newspaper, radio, and television headlines. The legend began when Gus’s uncle Pete bought the tiny hot dog shop in 1939 with $600 he won in a Pinochle game. The shop was little more than a narrow room, accommodating three or four customers at a time. It was strictly stand and eat, usually outside. In 1948 Gus took over the business when he graduated from Phillips High School. He made his secret sauce recipe at home every night. Only Gus knew the secret and it died with him. Gus worked so long and hard, bent over the grill, he was no longer able to stand up straight. There was a shelf over the grill in font of him, which made Gus stoop over as he cooked the hot dogs. When someone told Gus he should take the shelf down, he replied, “Where am I going to put the bread?" In his will, Gus left the Pete’s Famous sign to the Barber motorsports museum. 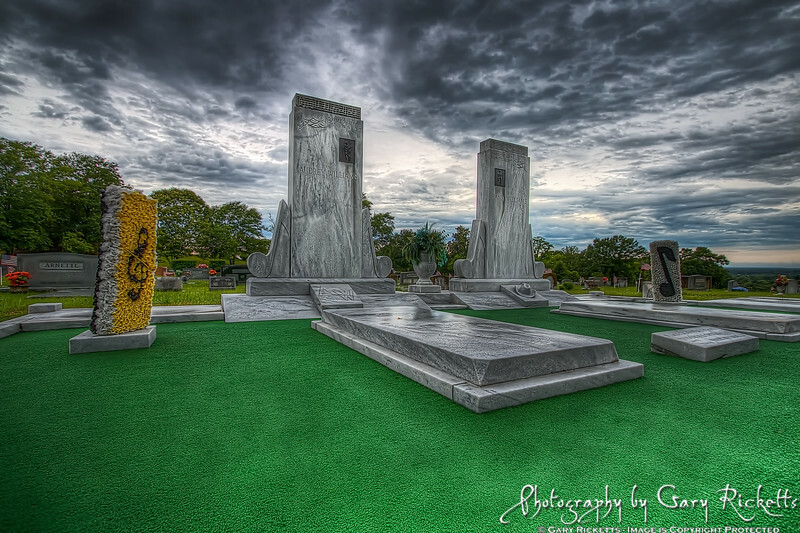 Hank and Audrey Williams resting place in Montgomery, Alabama. The Peanut Depot began roasting peanuts in 1907. Three of those original roasters are still used today! The tantalizing aroma of freshly roasted peanuts drifts out onto Morris Avenue in downtown Birmingham, Alabama six days a week. The Depot offers a wide variety of peanut flavors, which are packed in clear plastic bags to insure freshness. And if you want, you can have them delivered to your front door! Some of the most beautiful and historic country in Alabama, once homeland to the Cherokee, is found in and around DeSoto State Park in Fort Payne Alabama. The park is named for Spanish explorer Hernando de Soto, believed to have passed through countryside during his search for gold in the 1540's. Some believe, however, de Soto was not the first European to see the rivers, canyons and waterfalls of the region. Tradition holds that Prince Madoc, a Welsh explorer, may have visited DeSoto Falls as early as the 12th century. The fountain sculpture at Five Points South in Birmingham, Alabama was created by local artist Frank Fleming. The central figure in the fountain, holds an open book in his left hand and a nine foot tall staff in his right. An assortment of animals appear to listen attentively to “The Storyteller”. If one walks behind the storyteller, his back trouser pocket is partially open. Sometimes, there are interesting things there. Frank Fleming’s sculpture of different animals listening together to the story is intended to convey the idea of a peaceful kingdom. The Red Rain environmental general store operated in downtown Homewood, Alabama for ten years. The store offered earth friendly products and services, carrying a variety of handmade and fair trade merchandise. Birmingham residents could purchase items ranging from goat's milk soap to solar ovens. The store closed its bright red and green doors for good on May 3, 2009. Within a thirty-mile radius of Birmingham, Alabama there were abundant deposits of coal, limestone, dolomite, and clay—all the ingredients necessary to produce iron. James Withers Sloss built furnaces to produce pig iron in 1892 and the furnaces did not stop burning until ninety years later. In the late 1920's, an estimated 500 employees produced 400 tons of pig iron daily. In 1960’s, stricter air pollution standards ,foreign imports, and other factors shut down the furnaces. In 1981, Sloss Furnace became a National Historic Landmark. Vulcan, the Roman god of fire and forge, has been a symbol of Birmingham, Alabama for over 100 years. Birmingham’s location is unique in that the raw materials required for making iron - coal, iron ore and limestone - are readily available within a thirty-mile radius. Vulcan, originally built in 1904, is 56 feet tall, from toe to spear point, and sits atop a 124-foot pedestal. Vulcan is the largest cast iron statue in the world and the largest statue ever made in the United States. Built in 1905 on Eastern Valley Road in McCalla, Alabama, the Kimbrell Methodist Church served its congregation until the late 1950s. It then sat idle for approximately fifteen years until it was donated and moved to Tannehill State Park where it now serves as a wedding chapel available for rent from the park. In January 2011, the resort community of Ross Bridge in Hoover, Alabama was voted “Best Community in America” by the National Association of Home Builders as part of its Best in American Living Awards. The 1,700-acre development includes the Renaissance Ross Bridge Golf Resort and Spa. James A. Bryan became minister of Third Presbyterian Church in Birmingham, Alabama on August 4, 1889. Although an ordained Protestant minister, he became known as Brother Bryan because he addressed everyone as brother or sister. He is remembered for his untiring effort to help the poor and homeless. In addition to visiting the sick, airing six radio addresses each week, he operated two soup kitchens. On Christmas mornings he delivered toys to children who might otherwise have had none. Sometimes he would come home without his overcoat because he had given it to someone in need. Today, the Brother Bryan Mission continues to change lives. Ave Maria Grotto is a four acre park with 125 miniature reproductions of some of the most famous buildings and shrines in the world. The masterpieces are the creation of Brother Joseph Zoettl, a Benedictine monk of St. Bernard Abbey from 1892 until his death in 1961. His last model, the Basilica in Lourdes, was built in 1958 at the age of 80. Brother Joseph used all types of materials to build his miniatures: cement, marble, colored glass, ash trays, marbles, and many other donated and scavenged items. In 1858, a Carolinian named James Taylor Ross settled in the Oxmoor Valley of Alabama. During the American Civil War in the 1860's, Ross allowed the Confederate States of America to build a railroad supply line through his land. The stone bridge built to cross Ross Creek still stands today. The residential neighborhoods of the Ross Bridge community now occupy the rolling hills of the surrounding countryside. The Renaissance Ross Bridge Golf Resort & Spa is home to the world's third longest golf course, part of the Robert Trent Jones Golf Trail. Built in 1889, during the industrial boom, and opened in September 1890, the Fort Payne Opera House is still in use. When the silent movie era came along, the opera house was converted into a movie theater. Today, the Opera House regularly hosts live theater productions, professional ballet, and musical performances from classical piano to symphony. The Fort Payne Opera House is on the National Register of Historic Places and the National Register of 19th Century Theaters in America.